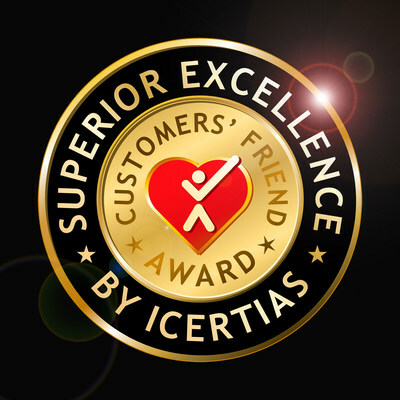 The international organisation ICERTIAS today in Zurich presented a complete redesign and new and improved methodology for their Customers' Friend award programme. Launched four years ago in September 2014, the international Customers' Friend project was created with the purpose of seeking out, detecting and rewarding companies that provide their clients and customers with the best user experience - those that foster a high level of professionalism, competence, kindness and transparency. Up until now, the Customers' Friend medal was in the form of a red pentagram representing a red diamond. In designing today's Customers' Friend medal, more than 12,000 respondents in more than 60 countries around the globe participated and contributed with their opinions and advice. It can therefore truly be said that more than 12,000 "designers" and opinion makers from all over the world – on five continents - participated in the creation and design of the brand new Customers' Friend medal. In order to create the most acceptable and impressive medal for the Customers' Friend certification, in a series of 24 surveys (from February to June 2018), the international organisation ICERTIAS asked 12,368 respondents worldwide about their preferences regarding the form and appearance of the medal itself. At the very beginning, 13 distinct medals were presented to the respondents. After the respondents chose what they regarded to be the most desirable, further design iterations and work on detail followed, and with each step a new survey to determine the direction of further design development. The final Customers' Friend medal we see today is therefore a result not only of leading graphic designers and marketing experts but also of the opinions and advice of consumers from all over the world. The result is indeed an impressive and extremely conspicuous new Customers' Friend medal that represents trust between consumers and suppliers on the market - and equally important - a medal that has a story - a medal with a heart in which the consumer is the centre. It is an acknowledgement that attracts attention and encourages additional customer confidence. The mission of the Customers' Friend programme is to promote and encourage the cultivation of a more quality relationship between product and service providers and their clients and customers. And all this in order to give consumers a better quality service while product and service providers gain more satisfied and loyal customers who are willing to spend more. The Customers' Friend goal is to promote and build customer-friendly relationships between consumers and quality companies on the market. The Information and data presented in this report and announcement are for informational purposes only. This report is neither designed nor intended to be used for making investment decisions. ICERTIAS (ICERTIAS - International Certification Association GmbH, Zurich, Switzerland), and the distributor of the information from this report, cannot be in any way responsible for decisions or actions carried out based on the information contained in this document. ICERTIAS and/or its partners, managers, and/or its employees are not liable for the accuracy and/or credibility of the information presented here.